Ertalyte® is an unreinforced, semi-crystalline thermoplastic. A variation of polyethylene terephthalate (PET-P), Ertalyte® thermoplastic is an ideal material for parts in applications where high loads or extreme wear are common. It is effective in wet and dry environments, with a high continuous service temperature (210°F/100°C) and a melting point nearly 150°F higher than acetal. Ertalyte® poly is used in a broad range of applications, from food processing equipment to fuel pump components to bearings, seals, and washers. Upland Fab has extensive experience in Ertalyte® machining and will deliver high quality, high precision parts that match your designs and exceed your expectations. Ertalyte® exhibits high strength and rigidity, and is easy to machine, making it perfect for tight tolerance parts with complex geometries. With outstanding wear resistance, a low and constant coefficient of friction, and superior dimensional stability in all conditions, this material is ideally suited for continuous motion applications Ertalyte® poly is resistant to mild acid solutions, chemicals, abrasion, and staining, and exhibits low moisture absorption. Upland Fab utilizes state-of-the-art multi-axis machining when working with Ertalyte® thermoplastic. Our advanced CNC technology ensures superior precision and perfect repeatability from the first piece to the last, with minimal handling and fixturing requirements. In many cases, even the most intricate parts can be completed in a single operation, resulting in fast turnarounds. Using DPD/MBD processes (Digital Product Definition/Model-Based Definition), we can machine complex Ertalyte® poly parts directly from your CAD models. Working directly from your digital design files helps eliminate errors and improve accuracy and efficiency, which in turn helps reduce costs. Reliable communication is a top priority on any project. When you work with Upland Fab, you’ll have a single point of contact from the first stage to the last, and you’ll receive consistent updates that will keep you up to date as your project progresses. We give you peace of mind knowing that your project is on track and on schedule. Upland Fab is your #1 source for high precision Ertalyte® machining. Request a quote to get our team started on your project, or contact us for more information. 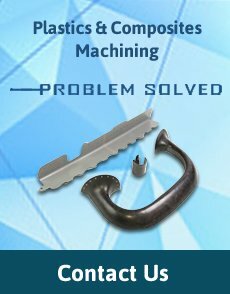 Since 1970, we have been providing top-flight plastics and composite machining in Southern California. Contact Upland Fab to learn more or request a quote to get started on the Ertalyte® thermoplastic parts you need.